If you’re a department leader, your boss will likely one day ask this question: “What is your business plan for your department?” As the leader of the Human Resources function, you can use these steps to answer that question. A frequently asked question at this website, it’s a difficult question to answer in a generic fashion because the needs of every company for the contribution of the HR department can differ widely. You can, however, use these steps as a guide as you develop your own HR business plan. But, the fundamental question you need to answer, to reply to your boss’s question, is, “What does your workplace need from the HR function?” Here’s how you can find the answer. Start your Human Resources department business plan by clarifying exactly what your boss needs and wants from you and in how much detail. You don’t want to spend hours and hours developing information or a detailed plan that the boss doesn’t need or want. That said, for your own clear purpose and direction, your own strategic plan for your department, this approach will yield great value. Read through the detailed job descriptions that have been developed for the HR Director/VP, HR Generalist, and HR Assistant. Are there functions listed in these job descriptions that you are not performing that you could perform that would add value to your organization? Start a function list. You can also use a commercially developed Human Resources department audit book/program or an occasional free Human Resources department audit plan list. Take a look at this list, plus add to the list, the functions that your Human Resources department is already performing and functions that you know you want to add—or subtract. Minute detail is not required until you are ready to put together your Human Resources department business plan when you complete these steps. Meet with your fellow executives to obtain an assessment of their current satisfaction with your services, additional services they’d like you to add, and their ideas about how HR can best support your organization’s mission, vision, and goals. Supply the questions to your key colleagues in advance of your meeting. Inform them that you have distributed the questions in advance so that they can solicit feedback from their staff, too. If you have effectively gathered the above internal and external information, you may be able to present the choices in a rating and ranking format. This is the key step within your organization for assessing what the line management and the employees want from the HR function. Of course, there are administrative and counseling functions that they might never consider asking you to provide that you will continue to provide as part of a professional HR function. The purpose of asking is to find the offerings that your customers think they need most. You are developing a great deal of internal information about your company’s HR needs. You might also look at recent journals from professional associations such as the Society for Human Resource Management (SHRM). Talk with colleagues in any local associations you attend. Take a look at literature available such as HR Magazine. 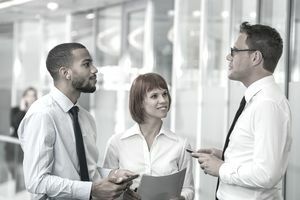 The articles from this section of TheBalance.com are particularly useful for planning the priorities and scope of the HR department business plan. Once you have gathered all of this information, or even, just enough—your executives’ priorities may give you extremely clear direction, for example—you can make a plan. You can see what you are missing in your HR department, what you might expand, what you need to focus on strategically to build your department’s contribution, and what you may currently offer that is not needed. From these identified missions, prioritize and make a plan, based on resources and your preferred method of presentation or accomplishment, of what you can accomplish this year and next. Some solutions may be HRIS-based needs; others may have to do with HR office offerings; others may require a strategic change in direction or the addition of a major function. You won’t know until you study and ask. Now, at last, you can answer your boss’s question: What is your business plan for your HR department?